Instead of identifying a person’s date of birth, death certificates and gravestones sometimes identify the deceased person’s age in years, months, and days. But what is the purpose of giving an exact age rather than a birth date, and how is this age determined? Are there any consistent rules for this process? Nineteenth and twentieth century death records also recorded the age at death, but this practice was not just customary. Instead, these modern death records provided statistical information for the nation’s politicians and doctors, as well as for life insurance companies. 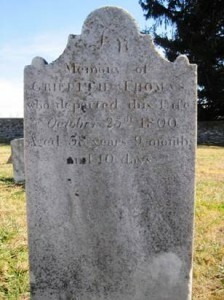 For example, in a Report of the Vital Statistics of the United States, made to the Mutual Life Insurance Company of New York, the author reported that the average age at death of the residents of Plympton, Plymouth Colony, Massachusetts, between the years 1812 and 1842 was 40 years, 10 months, 25 15/24 days. I have included a link to the 1857 report here. Because the death information was originally recorded using age in years, months, and days, the above statistical information would have been easier to calculate. Therefore, some (but not all) town, counties, and states recorded deaths using this format. Your suggestion is a good one, and one that occurred to me as well. Not only did I scour the NEHGS collection for information on double dating and tombstones, but I also asked my fellow NEHGS colleagues for their opinion on the matter. I was unable to find any information that would point to the tradition being influenced by the change in calendars. The only evidence I could locate pointed to it being a traditional style at the time. However, if you find any evidence to the contrary, please send me the information. I would love to get a better understanding of the origin of this tradition. I think Kendall’s point is a good one. If the idea was to provide statistical information, why not just put a birth date as well as death date on the headstone? A long time ago in my old Puritan hometown I heard that one’s birthdate was not inscribed on the tombstone because one was born in a state of sin.